Good table tennis footwork is essential if you want to play well. Discover how to move more efficiently and play better table tennis. Good footwork is essential in modern table tennis. It enables you to reach the ball quicker and more easily, which in turn enables you to play a greater variety of strokes. Additionally, good footwork enables you to play a better stroke and place your return more accurately, which puts your opponent under time pressure. It's also important to remember that good footwork will enable you to remain well balanced at all times whilst playing your strokes. 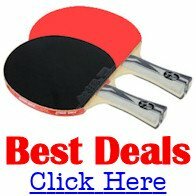 So whether you're learning to play table tennis, or you're looking to further improve your table tennis technique, these tips should help you to develop your game and should be incorporated into your training. The two main footwork patterns in table tennis are side to side, and in and out. But whatever footwork pattern you use, you should always make sure that your weight is on your toes, so that your weight is going forward. You should also make sure that you bend your knees in order to lower your centre of gravity. Let's take a look at the in and out footwork pattern first. In order to return a short service or a short return you will need to move forward to play your stroke, and then return to the ready position. 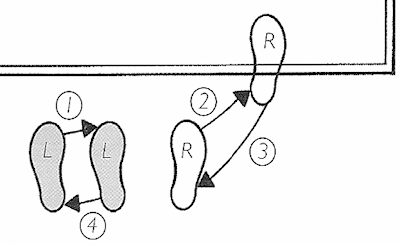 This is the in and out footwork pattern. So when moving in, you need to position your right leg under the table so that you can get as close as possible to the ball. You then play your shot and move back out again. Your left foot moves first, in order to get closer in to the table, and then your right foot moves forward under the table. After you have played your stroke, your right foot moves back out and your left foot then returns to its original position. You are then ready to play your next stroke. The main footwork pattern that you'll use in a table tennis match is the side to side footwork pattern. This footwork pattern is used when you are close to the table and therefore needs to be fast and economical. When moving to the left or the right, you should always move your outside foot first. So starting from the Ready Position, to move from the backhand to the forehand (for a right-hander), you move your left foot first, then your right foot, then your left foot again and then your right. So what you are doing is small, quick, side to side shuffling steps. And to move from the forehand to the backhand (for a right-hander), you move your right foot first, then your left foot, then your right foot again and then your left. Here's a video demonstration of the side to side footwork pattern. If you need to move to a shot that's played wide to your forehand side, you can use the cross-over footwork pattern. This is used when you do not have sufficient time to use the side to side footwork pattern, because you need to cover a larger area quickly. So for the cross-over footwork pattern, to move from the backhand side to the wide forehand side (for a right-hander), you move your left foot wide to the right, then using that left foot as a pivot, you move your right foot across as you play your shot. The video above shows a demonstration of this footwork pattern.